Musings 'n scribblings of a philanthrope .. : Sikka and Infosys .. The recent Infosys CEO Vishal Sikka's exit from Infosys made great news. What prompted Sikka to take the drastic step ? Could not Narayana Murthy have handled the sitation in a more dignified manner ? 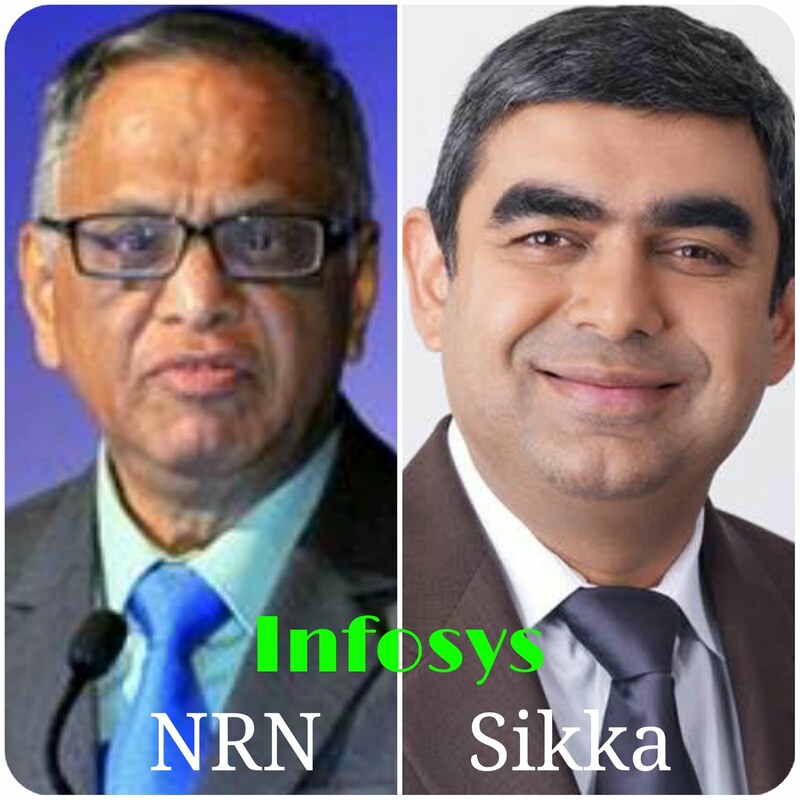 Here are few moves from Sikka (quoted in the press) which Murthy (NRN as he is popularly called) felt ran counter to the popular Infosys culture and damaged it, resulting in the quick and smooth intervention of the founders. These are some of the allegations raised by NRN against Sikka which NRN felt were against the initial entrepreneurial spirit that got Infy blooming to this scale from a small setup started 36 years before in Pune in 1981. The culture of extravaganza and splurge initiated by Sikka and team with the resultant loss in social esteem and prestige, NRN felt, was divergent to the values the founders of Infosys had envisioned for the company in the long run. While Sikka wanted everything to be seen solely though the mirror of financial performance of the organization, NRN raised the plates a lot higher, deviating from the usual run-of-the-mill type of organization, expecting the organization to be a role model for the entire entrepreneurial ecosystem in the country, upholding high standards of fiscal discipline, fulfilling social commitments and being a global role model in corporate governance. 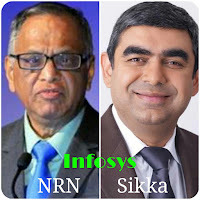 NRN felt Sikka had failed completely in pulling his team up to be able to meet, even partially, the lofty goals and objectives Infosys had set for itself. Looking at the other side of the coin, the point which NRN completely missed was the level of commitment an employee has towards an organization as different from that of a founder. All employees cannot have the "founder mindset" and work selflessly for the growth of the organization, risking the employee's personal life. The employee is as much bothered of his well-being as he is about the organization he serves. The case of Jeff Bezos, founder and CEO of Amazon is an example NRN should try to understand. Though Bezos draws a very modest salary, he ensures that all his employees are paid a bomb. The employees are motivated to give their best to the growth of the organization. Bezos understands that money is what motivates his employees. In the final run, indirectly we find Bezos benefits, his employees have made him among the top ten richest people on Earth by virtue of the value of the Amazon stock he holds. The remuneration Bezos gets from Amazon is a pittance compared to the value of the Amazon stock he holds. The other example for non-interference is from NRN's family itself. NRN's famous co-brother Gururaj Deshpande, the serial entrepreneur, who is known to start great companies in US, like Cascade Communication, Corel Networks, Sycamore networks, Tejas Networks, a123systems, airvana .. After it becomes a roaring success, he used to leave it for the professionals to manage, and set his mind on the next great entrepreneurial idea.. Click here for a detailed writeiup ..
Sikka's exit may not affect the Infosys stock value for long, it is sure to rebound, but the dent it has made in the employee minds of not being an employee friendly organization and of not being a pay master, is sure to pull down Infosys repute and impact it's growth in the long run, though NRN would differ. It's high time founders keep off and allow professionals to run the organization .. . Is it fair to expect ordinary employees, even 36 years after starting, to have the same zeal, commitment and founding spirit attitude as the founders, especially when Infosys is very cut and dry with initial recruits and looks only for exacting professionalism in them ? For a CEO, who came from a product based IT co, with almost $20 billion turnover to a process based company, home grown, to the HO in Bangalore, India for just 17 days in a year and prefers to spend the rest of the time with clients across the world, showed a clear disconnect with the founders philosophy and work culture. Getting the required CEO talent (and not CTO talent as in the case of Sikka) from India or any part of the world would not be a problem at all for Infosys. But it's high time Infosys moved from a sidelined role of IT service organisation to a major IT products organisation and that is where the future and money for Infosys would lie. In future, automation of IT maintenance work would wipe out Infosys, even before any of them would be even aware of the fast developments. Considering the remuneration of professionals in the west, could NRN have erred in his assesment of the growth of the company in the long run ? Having quit the organisation and departed from taking active part in the day-to-day decision making processes, should NRN have interfered and made the whole Director board concerned with the fast developments in the company of late ? The future will tell us who was right and who erred ? I totally agree with this view. The reason one becomes an entrepreneur is to have the freedom to achieve. If a founders desires the same (or similar) zeal in key employees, they must have the same freedom. The middle class values that NRN was trying to push down Sikka's throat is alright if he was still running the company. Having relinauished control and then attacking back is going to ensure that no independent minded, achievement oriented person will take over the reigns of Infosys in the near future. The times have changed from 1981. Not a single successful IT entrepreneur will be able to repeat even a small part of the success if they start today. Success is not the result of competence. It depends hugely on the prevailing eco-system. The time for IT Services start-up is gone. It is now time for products. Infosys has totally failed to capitalize on their eminent technological and financial powers to develop an operating system for computers or mobiles, nor applications that are globally known. Sikka comes from a product company. The Services mindset is that of a daily wage earner. You fill your time sheet and get paid. In a product company you build one great product and sell copies. Thus you multiply money. The business models are totally different. The mindset required are also like chalk and cheese. When Infosys got Sikka, I was hopeful that Infy will make the transition. It is really sad that a tall leader like NRN could not come out of his daily wage mentality and killed a grand opportunity to move Infy, and India, to the next big thing. What he failed to capitalize on is the knowledge that IT as he built is dying. There not much that you and I can do. NRN is the founder and he may become the grounder. You said it Sir !! Hope NRN does not become the grounder ..